Stylish combination of steel tubing and wood detail. 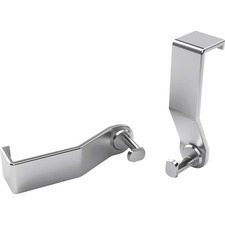 Features six accessory hooks and four casters, two locking. Holds up to 36 garment hangers. Six hangers included. Top and bottom shelves for storing hats and cases. Mounting: Stand Alone; Width: 44 4/5"; Depth: 21 2/3"; Height: 70 4/5".